FingerTec Ingressus I,II and IV devices have the capability to support all doors in opening and closing them when the alarm is triggered in case of an emergency such as a fire. Basically, Ingressus has an auxiliary input that can be configured via Ingress software. This input is a dry contact (disconnected) and has no voltage supply. By using this input, users can send a signal to Ingressus in case of fire hazards occuring within the building. You will however, still need to utilize a smoke detector or third party fire alarm system that can send signal to the alarm using a dry contact signal. i) The main idea below is how to keep the doors opened during a fire emergency. 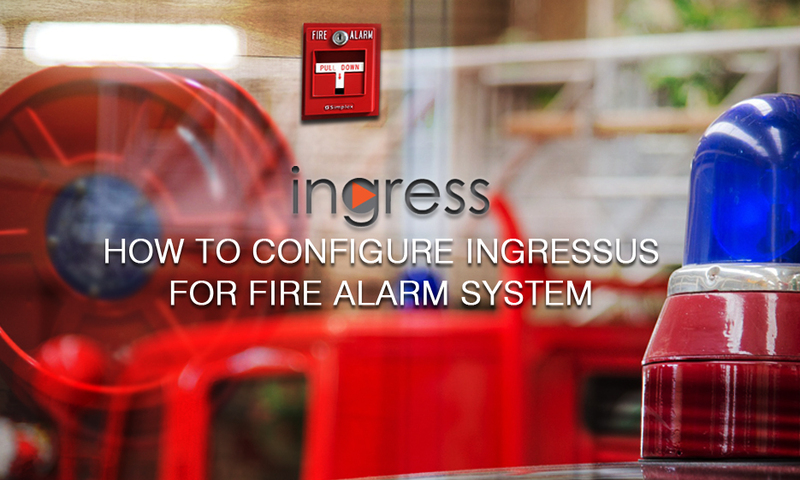 Please find below details for Ingressus specification that you need to know in order to set up for fire alarm system. (one aux-in / one aux-out) to control two doors during a fire alarm. (two aux-in / two aux-out) to control four doors during a fire alarm. (two aux-in / two aux-out) to control six doors during a fire alarm. Firstly, please set the Fire Alarm Condition to Auxiliary Input 1 and the Trigger Condition to Auxiliary Input Shorted. This is so that the Ingressus will receive the signal from the fire alarm through Auxiliary Input 1. Next, check both Lock 1 and Auxiliary 1 at Output Point Address as well as select the Action Type as Normal Open. In doing so, when the fire alarm triggers, it will shorten the Auxiliary Input 1 and cause the door to open (Auxiliary Output 1). Normal Open condition will thus keep the door opened until it is manually closed at Ingress software. ii) Close door automatically after the alarm goes off. As shown in the screenshot below, please set the Fire Alarm Condition to Auxiliary Input Disconnected and Input Point Address to Auxiliary Input 1 as well as the Action Type to Close. Once the fire hazard has been dealt with, the fire alarm will usually revert back to normal condition and stop the alarm. In this case, it will disconnect the Auxiliary Input 1 and close your door. As you can see in Diagram 2, your door should be connected in series with the Ingressus Auxiliary Output. Therefore, when the Ingressus Auxiliary Input is shorted, it will open the Auxiliary Output which will in turn open the EM Lock circuit. Diagram 3 shows that the door is connected in series with the NC/Com of Ingressus door. 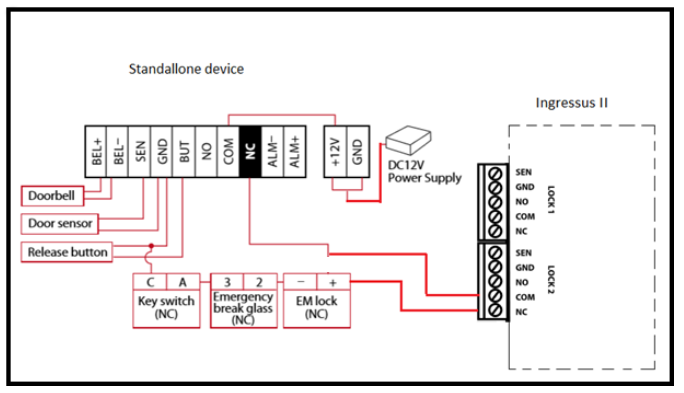 Hence, when the input is triggered, Ingressus Auxiliary Input will be shorted and unlock the Ingressus door as well as the EM Lock circuit. Please however, DO NOT USE a single Auxiliary Output for two doors as it will affect your voltage supply for the EM Lock. system, this is due to our continuous effort to improve our system from time to time. Please notify us at info@timeteccloud.com, we will update it as soon as possible.